Alan Burgess joined the club in the 92/93 season. He started playing for the 1st XI in 1993. He honed his talents by leaving the club in Dec 1997 for a couple of seasons and playing for rivals - Larne. He still finished the 97/98 season as East Antrim's top scorer! He returned "home" in the summer of 2001. Another Boys' Model boy, Alan has played in a few positions; centre forward, right wing, right midfield and now plays in the centre of the 1st XI midfield. Alan is another member of the infamous "Huggies Gang". 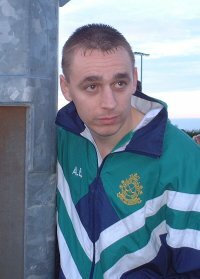 Alan has played for the Ulster Junior team in 1998, 2004 & 2005 and was a player in the Larne team that won the Linden Cup in 2000. Alan also had the honour of being the centenary season 1st XI captain!